When a trailer in tow disconnects from the vehicle hauling it, any accident can cause catastrophic injuries or death. A disconnected trailer traveling at high speed can produce a domino effect where multiple vehicles scramble to get out of the way of a runaway trailer that has become a life-threatening, uncontrollable missile. Even though commercial truckers are legally bound to follow federal and state regulations, runaway trailer accidents still occur. Any error or maintenance issue causing the trailer to disconnect can create a hazardous condition where the vehicles are involved in jackknifing, rollovers, head-on or rear-end collisions and unsecured cargo splashed across the roadway. Runaway trailers are not just a serious problem involving commercial truckers. 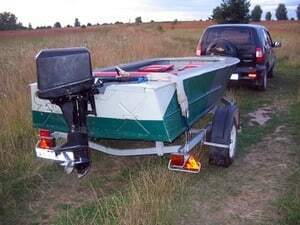 A trailer can easily disconnect when hauling a boat, lawn equipment, building materials, other vehicles and moving vans. Most runaway trailer accidents are the result of some type of negligence by the driver or others in charge of attaching the trailer to the hauling vehicle. How Does a Trailer Disconnect? Anyone of these conditions can easily disconnect the trailer when it hits a bump or pothole in the roadway. If the trailer is fully loaded and attached to the back of a semi-tractor, it can weigh 60,000 pounds or more. The devastation it can cause could be immeasurable. Any driver in charge of towing the trailer is duty bound to check every component on the trailer and rig to ensure safety. Also, the driver is responsible for ensuring that the trailer in tow has illuminated fully functional running lights and brake lights to increase the safety of all motorists in the vicinity. Drivers towing vehicles are required to follow all federal and state regulations and rules by securing the rig, trailer, cargo, and load. Every party responsible for a disconnect trailer accident is liable to the victim suffering damages, injuries or death. All victims have the legal right to file a claim for recovery to recoup their medical expenses, lost wages, loss of earning capacity, property damages, pain, suffering and mental anxiety. Surviving family members of a loved one killed in a disconnect trailer accident have the legal right to pursue compensation to cover funeral and burial expenses, lost future wages and other damages. However, building a case for recompense is complex. In all likelihood, there is more than one party responsible for the accident. A skilled personal injury attorney who specializes in runaway trailer accidents can use proven methods to determine liability to hold each party accountable for injuries, fatalities, and damages accountable for their neglect. Additional third parties might include the trucking company, vehicle owner, cargo loaders, truck parts manufacturers, maintenance crews, tire manufacturers and others. Disconnect trailer accident claims are complicated. However, a skilled attorney with years of experience in commercial litigation can provide numerous legal options to seek recompense and hold those negligent accountable for their action. Rosenfeld Injury Lawyers LLC are experienced in commercial vehicle accident liability cases. Our injury law firm fights aggressively to ensure their clients receive the maximum level of compensation and benefits they deserve. Our attorneys will investigate the case and determine all causes to see of hazardous roadway conditions, inclement weather, driver distraction or other negligence contributed to the accident with injuries or death. Call our law offices at (888) 424-5757 or fill out our online contact form to schedule a free initial consultation to review your claim for compensation. We accept commercial vehicle accident cases on contingency and are only paid for our legal services after negotiating your settlement or obtaining a jury award at trial on your behalf.